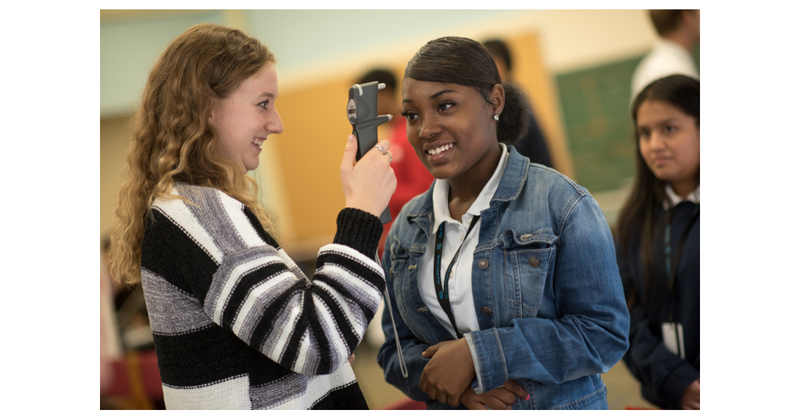 CHICAGO–(BUSINESS WIRE)–Chicago-area children received no-cost comprehensive eye exams and glasses donations as part of a school eye health event from Prevent Blindness Illinois, the Illinois Society for the Prevention of Blindness (ISPB) and the Illinois Eye Institute at Princeton Vision Clinic. The eye examinations were conducted by trained representatives from the Illinois Eye Institute at Princeton Vision Clinic. Any child with the need for prescription eyewear will receive two free pairs of glasses during a follow-up visit. The event was part of a grant program from UnitedHealthcare to nonprofits in cities across the country to coordinate free vision screenings, comprehensive eye exams, and eyeglasses donations. Prevent Blindness Illinois has received a $5,000 grant for the event. Prevent Blindness Illinois is an affiliate of Chicago-based Prevent Blindness, the nation's leading volunteer eye health and safety organization dedicated to fighting blindness and saving sight. Focused on promoting a continuum of vision care, Prevent Blindness touches the lives of millions of people each year through public and professional education, advocacy, certified vision screening and training, community and patient service programs and research. The Illinois Society for the Prevention of Blindness was founded in 1916 to reduce preventable causes of blindness. ISPB has a rich history of promoting vision and eye health in the state of Illinois and was instrumental in advocating for passage of several sight-saving bills before the Illinois legislature. Dedicated to the care, protection and preservation of sight, ISPB programs today continue to stress education, eye safety, information and research.